Still deciding on those last minute gifts? 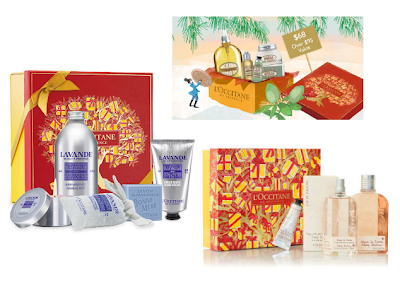 L'OCCITANE and Origins has amazing holiday sets featuring their best-selling products. Three of my top favorite L'OCCITANE scents and collections include Almond, Cherry Blossom and Lavender. The Almond Enchantment Set ($68) will keep your skin soft all winter long, featuring Almond Shower Oil (16.9 oz), Almond Milk Concentrate (3.5 oz), Almond Delicious Soap (1.7 oz), a mini Almond Shower Oil (1.18 oz) and Almond Delicious Hands (1 oz). The Cherry Blossom Set ($78) features one of my favorite products of all - Cherry Blossom Bath and Shower Gel. The Lavender Spa Gift Set ($68) will help you relax and unwind, with a light, refreshing lavender scent. Great for multiple stocking stuffers is Origins Surprise Twist (now $25, originally $47 with a $59 value), which includes 6 surprise holiday crackers each stuffed with 2-15 ml products, headband and holiday tip. The surprise items include Clear Imrpovement Active charcoal mask, Modern Friction Nature's gentle dermabrasion, Make a Difference Rejuvenating hand treatment, Make a Difference Rejuvenating treatment, Drink Up Intensive overnight mask, Ginger Burst and Ginger Souffle Whipped body cream. 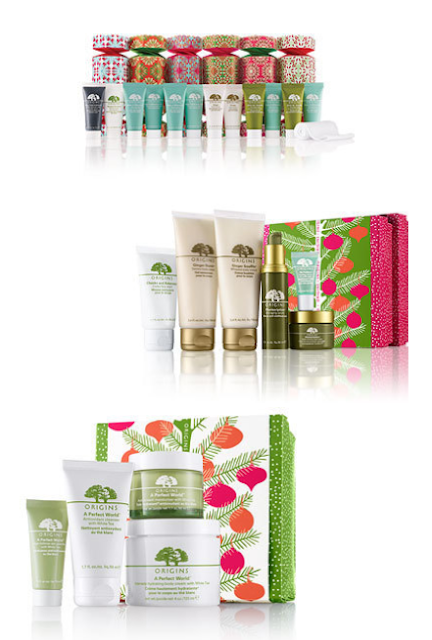 Origins Greats ($60 with a $134 value) six best sellers include Plantscription Youth-renewing night cream, Plantscription Anti-aging serum, No Puffery Cooling roll-on for puffy eyes, Checks and Balances Frothy face wash, Ginger Souffle Whipped body cream and Ginger Burst Savory body wash.
For some age-fighting favorites, gift the Perfect Protectors set ($55 for an $89 value) including A Perfect World Age defense guardian with White Tea, A Perfect World Antioxidant moisturizer with White Tea, A Perfect World Antioxidant cleanser with White Tea and A Perfect World Intensely hydrating body cream. Ooooo I love all these little sets!